Best productions of Elektra have a lead singer who can make the jagged vocal score sound effortlessly smooth and a director who can finesse the extremes of Greek tragedy into something psychologically believable for the 21st-century viewer. James Robinson’s Canadian Opera Company staging of Elektra with Christine Goerke scores on both counts. 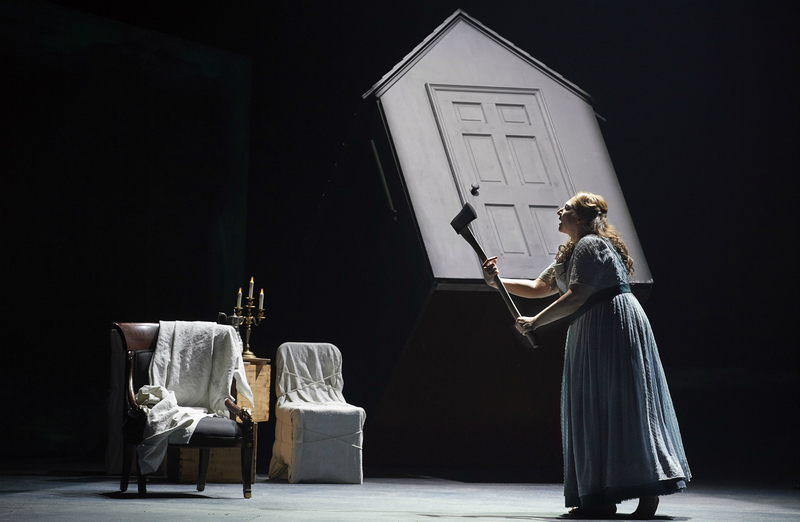 In this revival of the COC’s 1997 production (seen Jan. 26th), Robinson and Costume Designer Anita Stewart have replaced their original abstract, expressionist concept of an indeterminate era with designs that are more historically specific. From the opening scene with the maids in the grubby courtyard discussing Elektra’s fate while tidying up and stoking the fire, we are in the 19th century. They could be working inhabitants of an estate, roughing it up in the bush in the way of Susanna Moodie, or perhaps stuck in a decaying manor on the British moors. 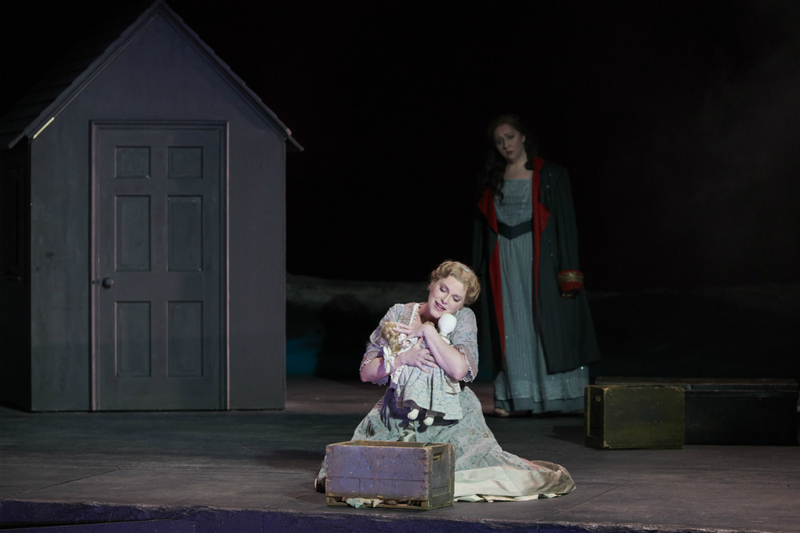 Both sisters wear dresses that have seen better days: Erin Wall’s Chrysothemis trying to look more put-together and marriageable; Goerke’s Elektra, wild and barefoot. Together with brother Orest (bass Wilhelm Schwinghammer) as a Victorian gentleman returned from foreign travels, the trio has not a small hint of the Brontës about them, and of the Brontës’ obsessed and cursed characters. There is a naturalness to Goerke’s delivery that is carried through until the final scenes. She is a teen with teen moods and delusions, but not a caricature, and she delivers the lines that tell of bloodshed and the tomb’s chill darkness as if sharing secrets with a confidante or diary. Her final dance upon hearing the news of Orest’s matricide is more childish twirling than maenad frenzy. The COC Orchestra under Johannes Debus follows Goerke in close step—which with a reinforced army of musicians resulting in three violin and viola sections, as well as bulked up clarinets, horns and trumpets—is a considerable achievement. 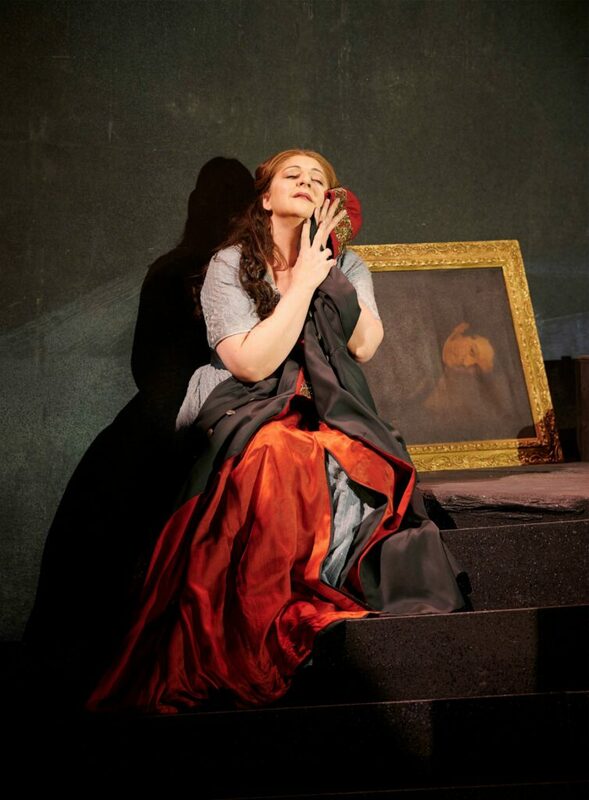 Richard Strauss’ score, the first of his many collaborations with librettist Hugo von Hofmannsthal, has a well-deserved reputation for loudness but it also contains intimate and lyrical moments where douceur is called for. The music often abandons tonality, and yet the sweeping late-Romantic vocabulary of Stauss’s subsequent works is undeniably there. The Orchestra nimbly negotiates all the atmospheric shifts. It is a late-Romantic and a post-Romantic score—and this time the staging is too. Not a lot happens in Elektra, which Hofmannsthal distilled from his Greek tragedy sources: a woman eager for somebody to avenge the death of her father waits long enough for her itinerant brother to come back home and do it. It’s the preceding and the subsequent stuff that matters, action-wise. Agamemnon’s sacrifice of his daughter Iphigenia (did he really sacrifice her? See: Gluck), results in his murder by Iphigenia’s mother and his wife, Clytemnestra, and her new husband, Aegisthus. After Orest avenges his father by killing his mother, he never returns to the stage in Elektra as he is already being pursued by the Furies for matricide—and this storyline continues in Greek legend and the tragedies based on it. The mythological Electra is much different from Hofmannsthal’s. In Euripides’ telling, she was cast out of Clytemnestra’s house and married off to a peasant before Orestes finds her, and in Aeschylus’ version the siblings meet at Agamemnon’s grave and are further urged on by the very active chorus. It’s Sophocles’ version that Hofmannsthal follows most closely, with Electra and Chrysothemis reduced to servant status at their mother’s home and Electra passively waiting for the arrival of the brother as deus ex machina. Hofmannsthal replaces the chorus with maidservants, adds the dramatic mother-daughter conversation and various mind games between the sisters to create, as well-noticed by Robinson, a claustrophobic 19th-century domestic drama about confined young women and a deluded dowager trapped in a world run by men. Mercifully, Klytämnestra is presented here without the camp and extravagant costuming that dogs the role in so many other productions. Susan Bullock is in a Victorian black mourning outfit with a personal retinue of two gossiping ladyservants (Lauren Margison and Simone McIntosh) always on hand. 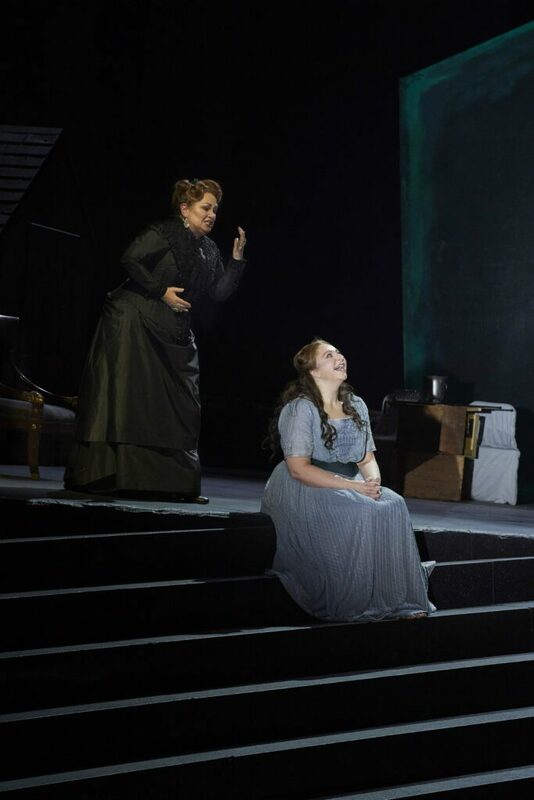 Bullock’s voice may be slightly underpowered and uneven, as is Wall’s still Arabella-esque soprano, but her dramatic commitment and emotional intelligence more than make up for the occasional dip under the orchestra. Michael Schade’s Aegisth is a fabulous comic miniature. He enters as a tipsy Victorian industrialist coming home late and is promptly dispatched to the land of the shadows in a trapdoor fight. Wilhelm Schwinghammer’s COC debut went extremely well: his confident and velvety bass is as voluminous as Goerke’s soprano—in this too the two singers were siblings. For Goerke’s voice, Elektra is a perfectly fitting glove. A singer in her prime, performing effortlessly in a signature role, with the spikes honeyed; the screaming, mellifluous, and the extremes of emotion served intimate. And, in a production that took a gambit on a very specific setting and won. It’s a rare theatrical perfect storm that should not be missed.